Over the past several years, educational institutions have scrambled to find fast, simple and effective ways to introduce 3D modeling and printing technologies into the classroom. TinkerCAD, a web-based computer-aided design application, aims to do just that. In addition to their free 3D modeling tool, TinkerCAD offers extensive educational resources that caters to a variety of learning strategies. TinkerCAD was founded by Kai Backman and Mikko Mononen in 2011, later being purchased by Autodesk, Inc. in 2013. Since its creation, AutoCAD users have generated over 4 million models ranging from toys, prototypes, home decor, Minecraft models and more. TinkerCAD’s easy-to-use Learning Center focuses on instruction through basic skill walkthroughs, step-by-step project-based lessons, and video tutorials for specific instruction and tips. In regards to privacy, TinkerCAD is in compliance with the U.S. Children’s Online Privacy Protection Act (“COPPA”) and the Family Educational Rights and Privacy Act, only sharing student information if required by law enforcement or for technical support. Basic Skills: Basic skills are used to get a fundamental base skills for all students. These tutorials focus on the creation on the same object to demonstrate understanding of technical execution. Educators can use this pathway to ensure total class comprehension. Project-Based Lessons: Project-based lessons allow for differentiated instruction in more advanced techniques. There are a variety of projects that inspire interest, so students can progress by creating a project that suits their specific interest. Quick Video Tutorials: Short videos intended to refresh student learning and offer tips and tricks for ease of use and access. Augmentation: Students can track the history of their lesson and go back to previous steps for refreshers. Teacher tracking of student progress through class creation. Modification: Students are able to have a final product after the tutorial that can be added to and customized by others in the Tinkercad community? Students can share their designs with others and collaborate on lessons. Math: Have elementary students print a range of numbers for tactile movement around a table, making different combinations of numbers to add and subtract to pair with the correct answer. Science: Students can create models of vascular systems for print, connecting syringes or pumps to the system to see how blood is pumped through the human body. History: Students can take existing data of collapsing ancient structures and rebuild them to what they would have looked like centuries ago. English: Students create models of various characters in their favorite books, using descriptions from the novels. Teachers log onto https://www.tinkercad.com/teach and obtain an “Invite Code” from the Teach page. This code is shared by email or can be written on the board for the students to enter. Students log in and access their dashboard by clicking the Tinkercad logo. Students enter the “Invite Code” in the Get Approved box. They are added to the teacher’s Moderated Kids as approved Tinkercad users. 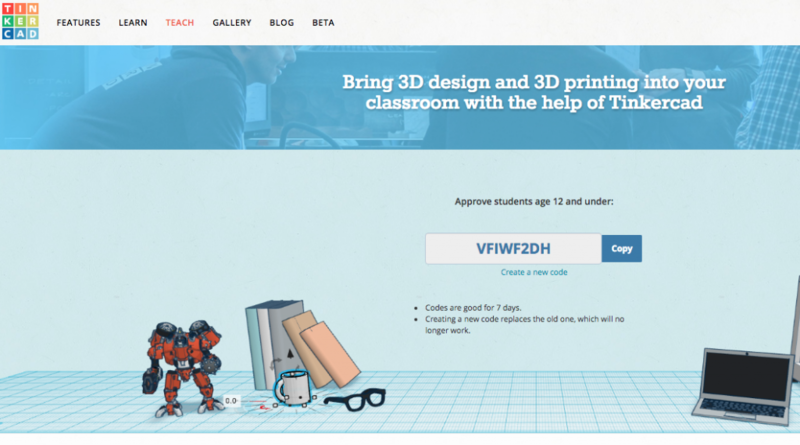 *Students age 13+ may create their own Tinkercad account and start designing immediately. Students age 12 and under will need your Invite Code for instant approval of their accounts.